Scrub potatoes and cut in half. Cook in boiling, salted water for 15 minutes or until tender. Cook bacon in a frypan until crisp. Drain on kitchen paper. Cut bacon into even-size pieces. Wash spring onions and chop finely on the diagonal. Grate one tablespoon of rind from an orange and reserve for the dressing. Peel oranges, removing white pith, and cut into segments. 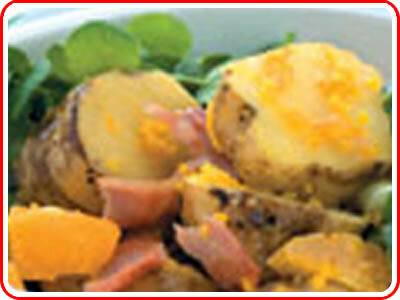 Mix potatoes, bacon, spring onions and oranges together with watercress, rocket and dressing.